Want to own a professional laser distance meter with higher precision? 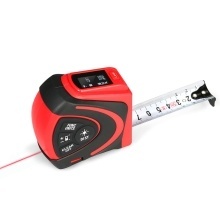 Try this digital Laser Distance Meter which has tape measure as well. It can measure the distance, area and volume. It also can be used for indirect measurement by Pythagorean theorem. This laser range finder, as a superior measuring tool can be widely used in construction and industries, especially in large areas such as rooms, apartments, buildings, real estates, factories, warehouses, housing area, volume measurement, etc. 2 in 1 Laser Rangefinder & Higher Accuracy: 2 in 1 5m measuring tape and 30m laser distance meter for measuring objects, high accuracy: ±2mm. The metal back clip design to hang on a belt or pants for hands-free use. Better Operation: Operate with screen rotation, automatic calibration and pull ruler auxiliary in measuring, clear LCD display with backlight digits for easy readings. Strong lock button for tape measure automatic locking and springback. Multiple Measurement Modes: Distance/area/volume/single/Max&Min/continuous measurement and indirect measurement by Pythagorean theorem. With built-in 300mAh 3.7V rechargeable li-ion battery, convenient for charging via USB interface. Various Settings: 50 groups data memory, 3 measurement units: m/in/ft, buzzer indicator, addition and subtraction, automatic shutdown without operation 180s. 25mm width of tape measure is softer and more durable, not easy to break. Wide Applications: Can be used in construction and industries, especially in large areas such as rooms, apartments, buildings, real estates, factories, warehouses, housing area, volume measurement, etc.